The worst problems are often ones we make for ourselves. For instance, while wandering Astroneer’s idyllic starter planet, I found a hole. Its alluring darkness contrasted the planet’s candy swirl aesthetic so perfectly that I couldn’t resist. I gently edged my way down one of its walls. Then I started sliding. Then I kept sliding. Then I realized my lifeline of oxygen tethers was now far, far away. Then I stopped worrying about that, because I realized the impact of reaching the bottom of the hole had killed me. Ostensibly, the central goal of Astroneer, a single- and multiplayer space exploration survival game that just launched on PC and Xbox One after more than two years of early access, is to craft your way into the stars and onto each of seven planets. There is, however, no gruff commander, no gentle yet urgent science officer, and no audio-log-powered narrative bread crumb trail spurring you on toward this goal. 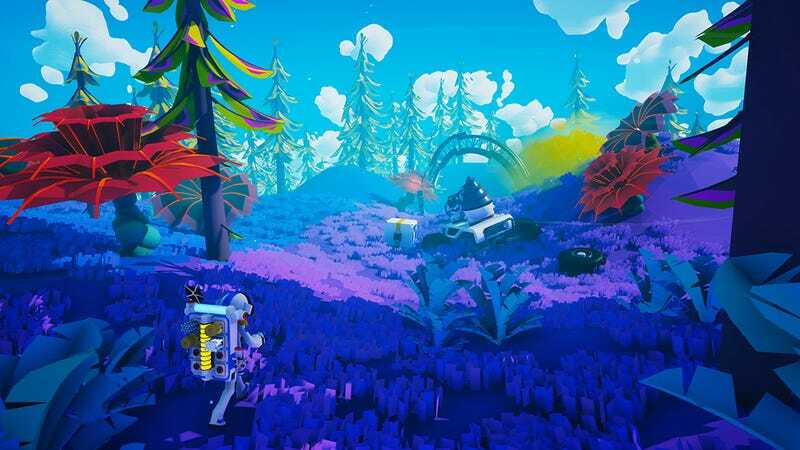 Instead, Astroneer is a game about exploring planets at your leisure. Sure, there are some hazards—occasional storms, aggressive flora—that pose active threats, but for the most part, you’re driven only by your whims and your need for crafting supplies. That means you can go hours without encountering any real danger. Or you can fall into a hole and die, revive, and then plunge right back down that hole and slowly but surely inch your way forward—compelled by the irresistible forces of sheer curiosity—like I did. For my trouble, I was rewarded with all sorts of interesting curiosities, ranging from the impressive (vast, sparkling caverns, poison-belching plants I’d never encountered) to the humorously grim (multiple backpacks left behind by other, presumably deceased explorers in the exact same fashion as mine). Oh, there’s the whole breathing thing. That matters. Astroneer’s coolest core mechanic is the air tether system. On your own, you can’t breathe for long, but your base and other support structures provide you with precious, life-giving oxygen as long as you’re in proximity to them. Using craftable tethers, you’re able to build out from there, slowly but surely constructing crisscrossing spiderwebs of otherwise unperturbed territory. It gives the game a gentle yet always precarious rhythm: Every 15 steps or so, you’ve got to lay down a new tether. It just takes a press of a key, but if you forget, you might end up breathless at the bottom of a hole, watching the metaphorical clock tick down in the form of the air meter on your backpack. These glowing, oxygen-rich veins don’t just keep you alive; they also remind you of where you’ve been and keep you focused on where you’re going. Astroneer’s planets are vast, but after playing the release version for a few hours, I’ve yet to get lost. Instead, I follow whatever path I’ve mostly recently built while chuckling at the remnants of paths that led to other, more ill-fated adventures. In many games, Astroneer’s relative directionlessness wouldn’t work. While the tutorials could still use some improvement, it mostly does here. There’s a joy to picking a direction and just observing grandiose, otherworldly sights while collecting materials and occasionally coming across artifacts left behind by other explorers. Plants and caves and alien structures feel grand and unknowable. You, by comparison, are just an ant with a cool helmet. This game isn’t really about you. You just happen to be there. So you explore, trying to piece together what happened to who—or what—came before you. Astroneer isn’t just about looking; it’s also a game in which nearly everything can be touched. You can manipulate land with your terrain tool. Your backpack, with rows of slots that objects and materials satisfyingly snap into, functions as your UI. Crafting stations also have their own interfaces instead of traditional menus, making the game world feel tangible and real, despite the psychedelic alienness of its locations. Crafting and base management keep it all grounded. You physically slot materials into a variety of 3D printers and research stations and wait—sometimes for seconds, sometimes for multiple minutes—as they do their thing. You can re-route power to speed things up using plugs that snap into place on platforms of various sizes. Again, there’s a satisfying rhythm to it, if not an urgency. Astroneer’s early goings, especially, are about discovery—both in terms of understanding your environment and learning what you’re capable of. Each tiny step forward is a triumph. When I first figured out I could build tethers to create oxygen-rich pathways away from my base, I nearly whooped with glee. For better and for worse, Astroneer streamlines a lot of that now, giving you access to a fully functional base right off the bat. This time, I knew how to create tethers, and the supplies I needed to do so were mere feet from my base, meaning I didn’t even need to risk suffocating to collect them. I started out feeling fully in control and, hole mishap aside, I haven’t felt any other way since. Perhaps later planets will give me more of the triumphant feeling I’m seeking, the one that made Astroneer’s early access version feel so special to me. For now, it’s happened just once, when I emerged from that hole after, somewhat paradoxically, tunneling my way up and out. It was slow going, and I just ended up tunneling to other portions of the hole on multiple occasions, but when I saw the blue-purple cotton candy sky again, it was like being greeted by an old friend. The worst problems are often the ones we make for ourselves, but it feels damn good to solve them.